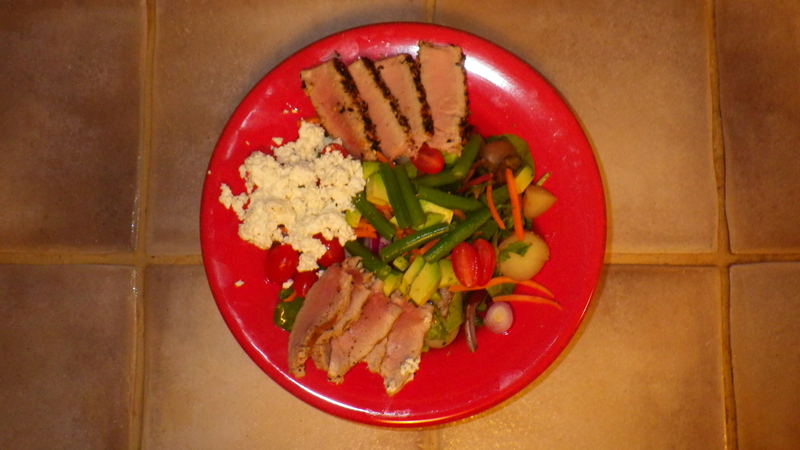 What to do with leftover Ahi Tuna? Make a great salad! I was very lucky last summer to win a gift card to our local fish monger, Gimli Fish Market. I’d actually never shopped there before, but for a special pre-holiday meal with friends last month, I took the fish-lady’s recommendation to try cooking Ahi Tuna at home. This is what a 1kg of tuna looks like – those plates are 8.5 inches wide. That’s a lotta YUM! 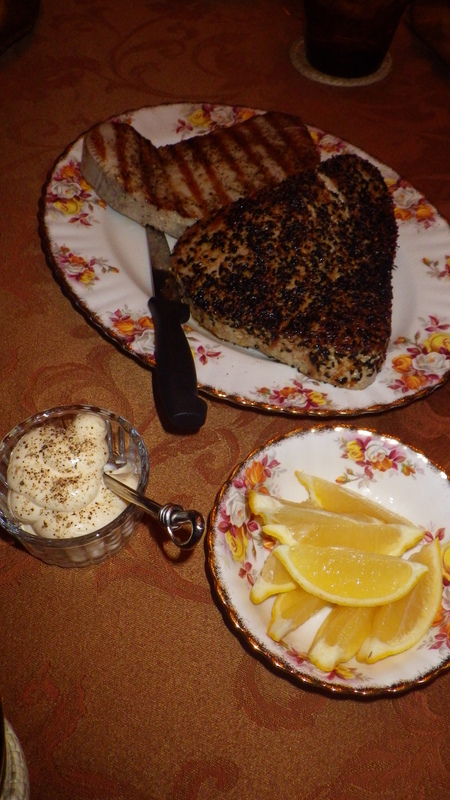 I’m so glad I listened to both the expert fish-lady, and to one of my fellow food bloggers, Rheanne Marcoux of Sucre & Farine to try Food & Wine Magazine’s Sesame-Crusted Tuna Steak recipe. It was delicious and super simple. Prep time and cook time together were less than 10 minutes. The recipe was super easy, and though Ahi tuna steaks in Winnipeg are not cheap, I was able to master a favourite fish at home and impress my guests. Now I can now cross that to-do off my bucket list and try some other types of fish at home in 2013. 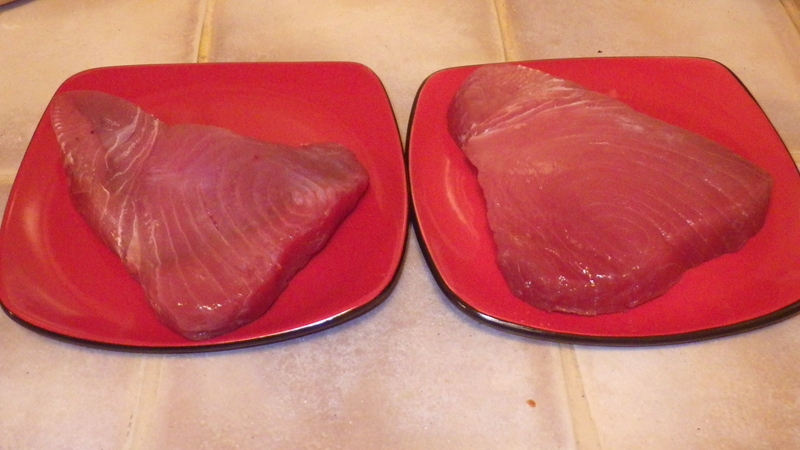 The two huge Ahi tuna steaks were much more food than the 4 of us could eat for dinner. Thankfully, my dear husband liked the fish, which had the same consistency as his favourite, Prime Rib roast. I was very worried that he wouldn’t like the rare sear on the fish as he’s not a fan of sashimi like I am. The next day for lunch we decided to make a gourmet salad using the leftovers and this is what I came up with. My DIY dinner salad platter for two. 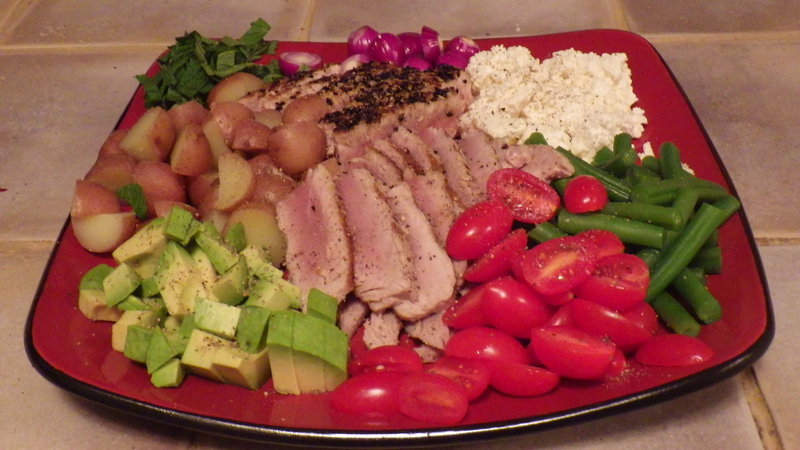 This was my riff on Salad Nicoise with homemade feta, parboiled baby potatoes, quick-steamed green beans, avocado, grape tomatoes, fresh mint, sliced shallots and of course… the leftover tuna. I drizzled it with my favourite Kraft Calorie-Wise Balsamic dressing for a quick finish, and boy was it delicious! All dressed up and ready to eat! Whenever you have some great leftover protein in your fridge (chicken, steak, pork, fish) and a hodgepodge of vegetables, I do recommend giving this easy meal idea a try. Do you ever cook fresh Tuna? Please share your favourite recipe in the Comments section.